Glenn Beck drew a crowd and a good deal of commentary from across the political and religious spectrum. 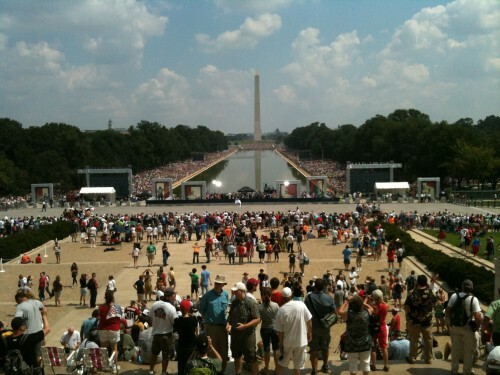 I wasn’t at Beck’s “Restoring Honor” rally this past weekend and I haven’t spoken to any one who was, but I did come across a number of articles, editorials, and blog posts that offered their take on what was going on. Needless to say, it wasn’t all positive. But, as if to demonstrate that people remain more complex than our tendency to reduce the world into binary oppositions suggests, the most scathing review I read came from conservative, Southern Baptist seminary professor Russell Moore, and one of the more self-consciously open-minded pieces came from the LGBT Editor of Religion Dispatches, Alex McNeill. Ross Douthat, who was at the rally, offered his take on the political implications of the “apolitical” rally in his NY Times editorial and a follow-up blog post. There is not much that I would care to add. I’m basically in agreement with Moore, but rather preferred the sensibility to the actual people at the rally demonstrated by McNeil. But thinking about the rally put me in mind to comment on a couple of other pieces I’d read within the last few days. Beck (along with Limbaugh, Hannity, and company) tends to symbolize for many people the marriage of free market economics with cultural conservatism that came to dominate the political right from the late ’70’s through the present. Essentially it is the Reagan coalition. But what if that marriage was an inherently unstable mixture? Sometime ago I was struck by a particular formulation offered by historian Eric Miller of Christopher Lasch’s critique of the both ends of the political spectrum. According to Lasch, both ends harbored a fatal tension. The Left called for socially conscious and active individuals while promoting a vision of the self that was atomized and unencumbered. The Right called for the preservation of moral tradition and community while promoting an economic order that undermined those very institutions. This remains, to my mind, a very apt summation of our current political situation. 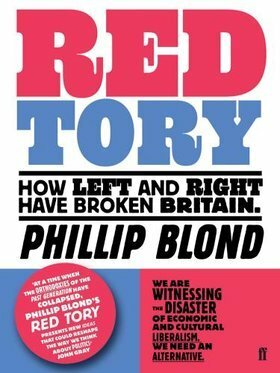 In two recent essays, Philip Blond and Jonny Thakkar call for what they have respectively termed Red Toryism and Left Conservatism. Neither Blond nor Thakkar cite Lasch, but they each channel Lasch’s analysis of the inner tension within modern conservatism’s attachment to free market ideology. In “Shattered Society,” Blond, a London based academic turned political activist, laments the loss of mediating institutions which sheltered individuals from the power of the state and the market. The loss of our culture is best understood as the disappearance of civil society. Only two powers remain: the state and the market. We no longer have, in any effective independent way, local government, churches, trade unions, cooperative societies, or civic organizations that operate on the basis of more than single issues. In the past, these institutions were a means for ordinary people to exercise power. Now mutual communities have been replaced with passive, fragmented individuals. Following anthropologist Arnold Gehlen, Thakkar assumes that habits and routines and the cultural institutions that support them are necessary for human flourishing. These culturally inculcated habits and routines function as instincts do for other animals. Apart from them we would be “prone to unbearable cognitive overload.” A predicament that is all the more palpable at present than when Gehlen wrote in the middle of the last century. For Thakkar, this means pursuing a “commitment to think each case through on its own merits: if something is harmful or unjust, we should try to change it; but if something valuable is being destroyed, we should try to conserve it,” rather than blindly submitting to the demands of the growth economy. Whether we agree with the details of their policy suggestions or not, it seems to me that both Thakkar and Blond, like Lasch before them, have perceptively diagnosed the inner tensions of the political right (and left) and the cultural consequences of those tensions. Thanks for the engaging post. As an Australian who lived as a poor graduate student in the USA for several years, the most important lesson I see is for the US to become more trusting of the state to help guarantee the economic and social conditions in which mediating institutions can thrive. A healthy associational (‘civil society’)life depends upon a degree of security. Australia is one of the few countries to have a healthy economy after the GFC. One of the reasons for this is that our banking and financial sectors were better regulated. We also have a more generous national minimum healthcare and social security system (combined with private sector options). To invert JFK’s words, we do need to ask not just want we can can do for our country but what our state can do for us. Keynesian social democracy helps to provide the economic and social security for the associational life and active democracy. Thanks for adding the international perspective Stephen. There is indeed a suspicion of the state in certain quarters. In many cases this is not entirely unwarranted, in others perhaps exaggerated. I do wonder if an over-reliance on centralized state mechanisms poses a danger to the mediating institutions from another direction (More Hobbesian, less Lockean). Where the state takes up a role, it is no longer necessary for mediating institutions to fill it. I think scale is important here, the centralized state in the US for example operates a larger scale than say Sweden. This distends the bureaucracy and removes agency from the local institutions that operate closer to the citizenry. I’m not arguing against a role for government, only looking for the best role. On the matter of public assistance, Blonde argues for what he calls “budgetary capture,” which amounts to giving local citizen groups power of government budgets. He talks briefly about this in the last third of his piece. Let me know if you have any thoughts on what he writes there.